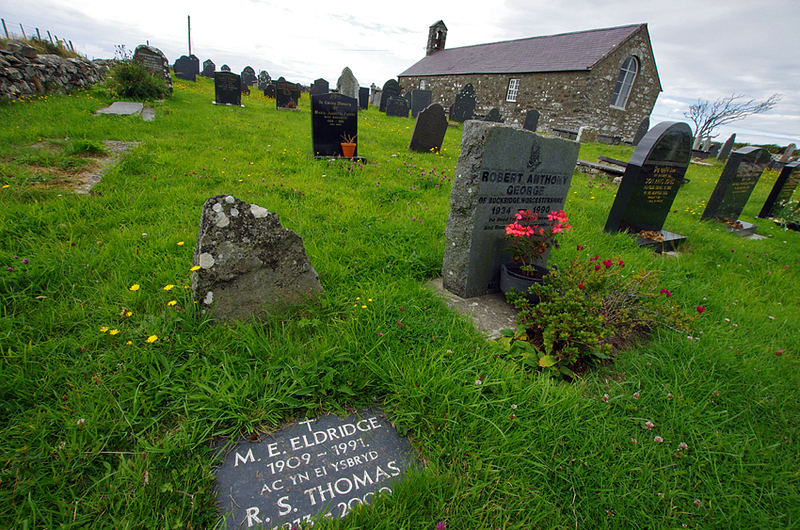 R.S.Thomas moved to Aberdaron in 1967 with his wife. They borrowed a big house(right photo*) on a hill, close to a very old church built in the 19 century by the landowner, Lord Newborough, and called New Church. However it was disliked by the villagers and was not used except its graveyard. Instead of it, there was an older church standing on the shore. It had been abandoned for a long time yet was restored and has been used for the servises since then. 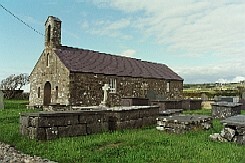 This church is called The Church of St. Hywyn and R.S. served there. It has two naives and is much wider than the one in Manafon. 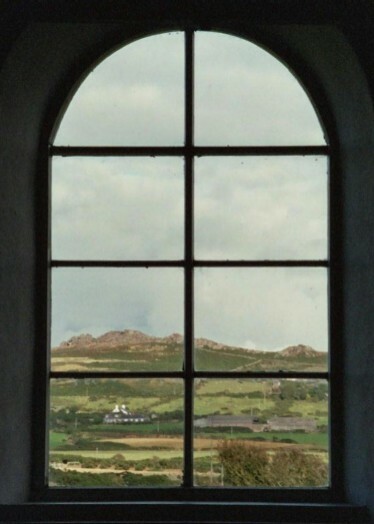 The house saw down at the church and the islands called Gwylan Fawr and Gwylan Fach, and beyond them there is Bardsey Island, where had been a goal of old pilgrimage route and many holy men were buried. He and his wife shared it but their lives were independent. 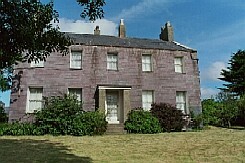 Now the house is called the Old Vicarage. There is an interesting episode about his house. An interviewer who once visited his house described it was "cold, even austere"1 and R.S. replied to him, "We get eight months of winter here." However he felt cold because not only of that but of R.S. 's "reserved and cold" attitude. Sermons preached by R.S. at The Church of Hywyn were Welsh since the villagers spoke Welsh daily -- it is said 60 percent of them are native speakers of Welsh and even now. However, while he stayed there as a vicar, this old village became a resort area during the summer, and some sermons came to be given in English for the visitors. 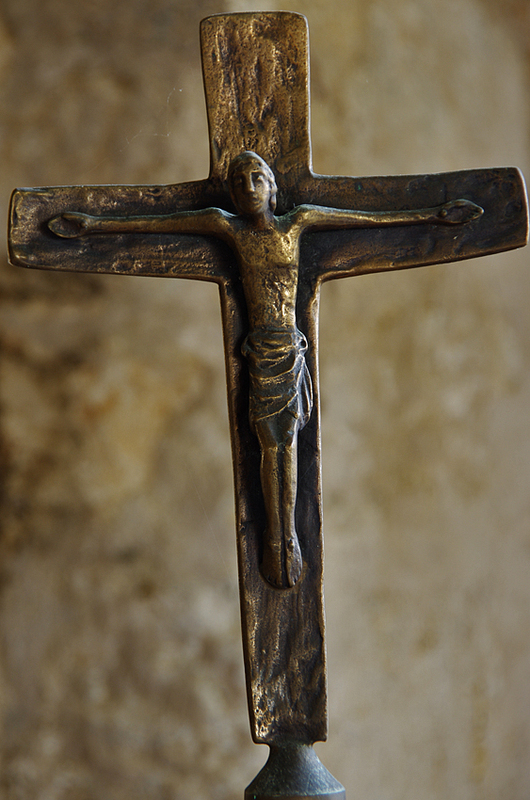 One tension within himself was created from this. The all villagers were very kind. R.S. Often baked cakes and had tea with elderly churchgoers. Yet, as R.S. once said to an other interviewer, "I don't mix with people,"2 he did not excessively want to mix with the villagers apart from the churchgoers; he liked to be alone. He often wandered on the shore silently and meditated at The Church of St.Maelrhys, about ten minutes away by car from The Church of St.Hywyn. 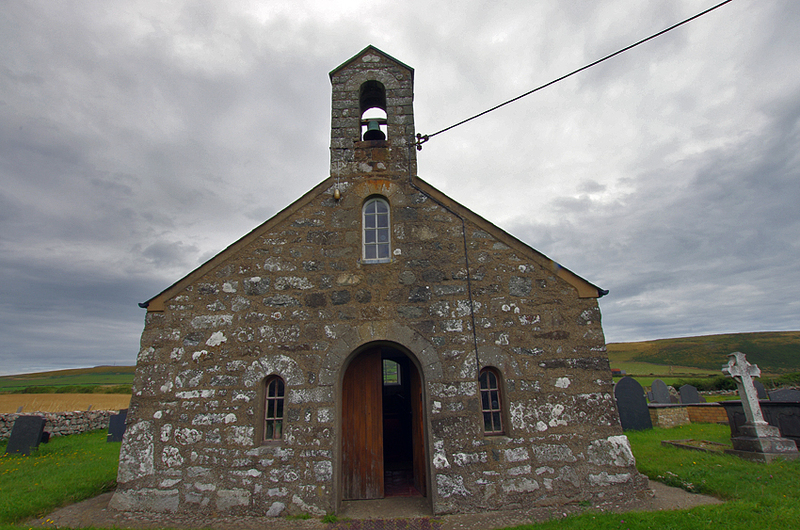 It was and is a very small church isolated in the country. The strong winds constantly blow outside but the inside is very silent. In 1969, however, his wife fell in a serious and painful illness and was sent into the hospital in London. It took three years for her to recover from such an illness. Unfortunately, although she was a painter, her eyesight was damaged strongly. And a great change had come to R.S.. Until R.S. arrived at Aberdaron, he had gotten tired to emphasize his Welshness. In 1969, 2 years later since he had come here, he confessed, "I became rather tired of the themes about nationalism and the decay of the rural structure in Wales, ... beating my chest and saying 'I am Welsh'"3. While he spoke Welsh with the kind Welsh-speaking people in Aberdaron, he gradually became to feel unnecessary to go on pushing these themes. Abandoning the propaganda for Wales, then, he turned to new themes. He started to stare at himself in the reflection of the mirror of the sea and his eyes turned into his deepest mind. He also began to meditate and ponder God in the 20 Century when science and technology began to advance rapidly. He, stating in this rural area, began to feel dread of atomic bomb, that would threaten the nature through which he could feel God4. He concentrated on a theme old but new -- questing for God in this modern world and creating new myth that could be adopted to it. The God-given land of Wales has been already corroded not only by the English and their tongue, but also by all the appurtenances of modern material culture5. 4 years passed since he arrived at Aberdron and his new collection of poetry entitled H'm which indicated his new poetic direction was published eventually. The familiar Iago Prytherch completely vanished, as having been indicated in 'The Grave' which was included only in Anglo-Welsh Review (Summer 1969). There was no rural Welsh life nor natural beauty in this book. Instead, 'Once,' the first poem of H'm, begins with a line, "God looked at space and I appeared". "I" heard "the fire sermon" and "held my way/ To the light" with "You, rising towards me out of the depths/ Of myself." And this finishes with "We went forth to meet the Machine." Here his long struggle to seek for the existence and the meaning of God in this modern world began. This was a tough challenge and also "testing his faith/ On emptiness"('In Church')(Pieta, p.44). This challenge, however, gave somewhat shock to his readers. John Wain complained about it in his presentation. A.M.Allchin, although he himself valued Thomas's poetry after H'm, said, "Lovers of the poetry of R.S.Thomas may have felt somewhat daunted by the publication of the collection entitled H'm in 1972. 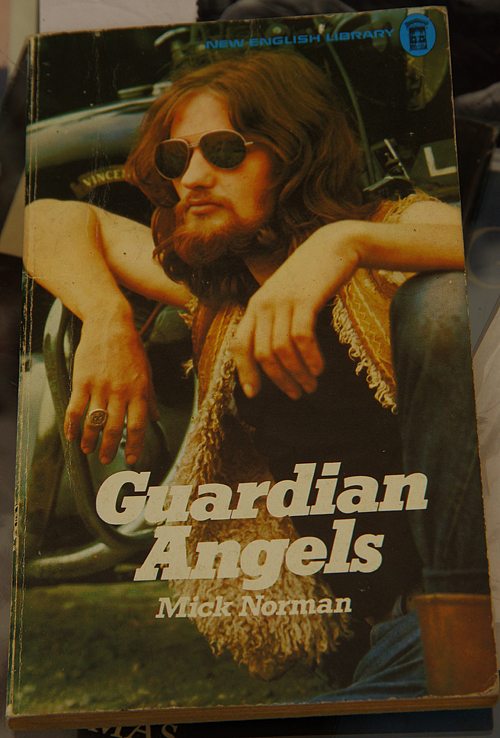 "6 In 1970s and 80s London journals had no attention to his poetry; they "gave his books perfunctory reviews"7. But the writings by Brian Cox or A.E. Dyson encouraged R.S.Thomas. Their friendchip was also helpful for him. And R.S. served Aberdaron and composed poetry seeking for God until 1978; R.S. retired from the Church on Easter Sunday 1978 and moved to Sarn-y-Plas with his wife. 7. Brian Cox, 'R.S.Thomas, 1913-2000', Critical Quarterly, vol.43. 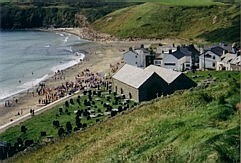 2002: I visited Aberdaron for the first time with my two companions. 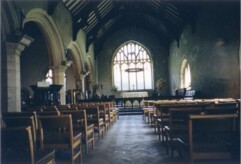 It was a Saturday afternoon in August 2002 when I visited St. Hywyn's Church. Young men played their noisy music outside the church and people enjoyed their holiday on the shore. Some of them listened to their music, drinking beer. Some of them were wandering the shore. Some children rushed into the church and a volunteer gave the instruction to them. Yes, it was a holiday. This village was also a good resort to visit. They enjoyed themselves. 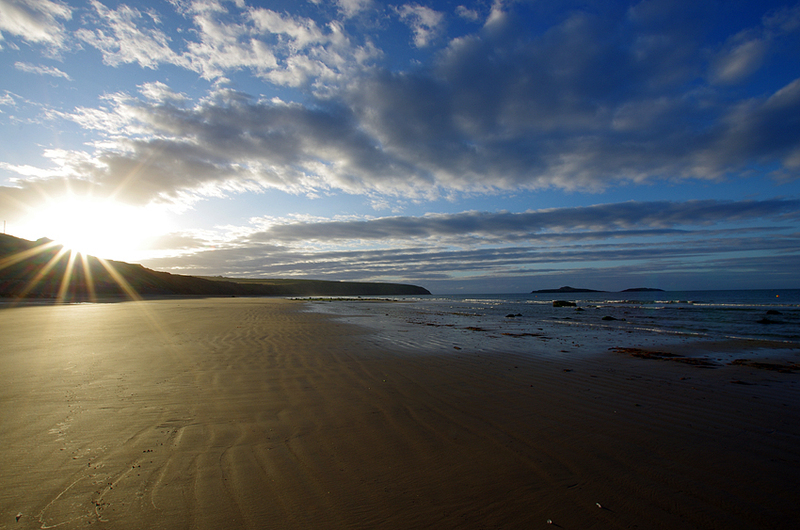 I could know an aspect of Aberdaron. After I had taken photos and bought some postcards, books and a CD from her, I drove to St. Maelryhs Church with my companions. It was really isolated from the summer resort and any houses. It was very silent inside but strong winds constantly blew outside. 2003: I visited there again by myself. While driving from Caernarfon to Aberdaron alone, I was caught in a shower and I remembered my last busy visit. However, I don't need to hurry this time!, I said in my heart. When I arrived there at 14, it stopped raining and sun shined. 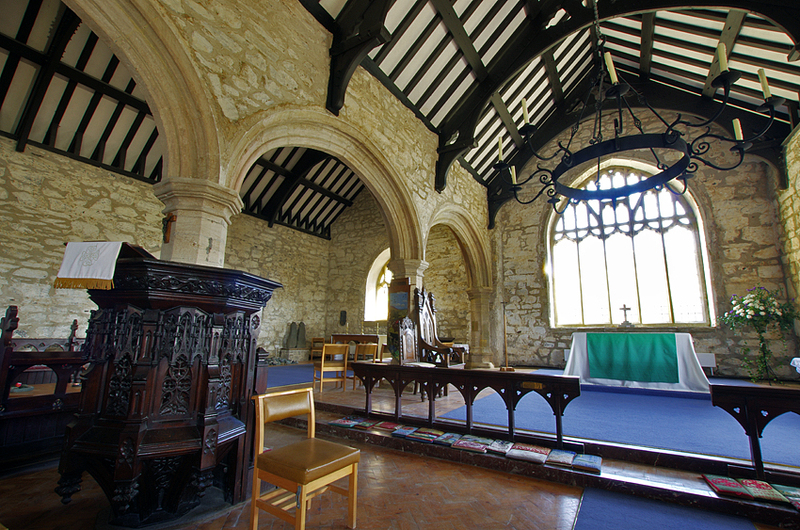 After having checked in a B&B on the hill, I headed for the centre of the village to visit St. Hywyn's church on the beautiful shore. I had a chance to talk with the vicar. Lucky was I! Then I went to St. Maelryhs Church. 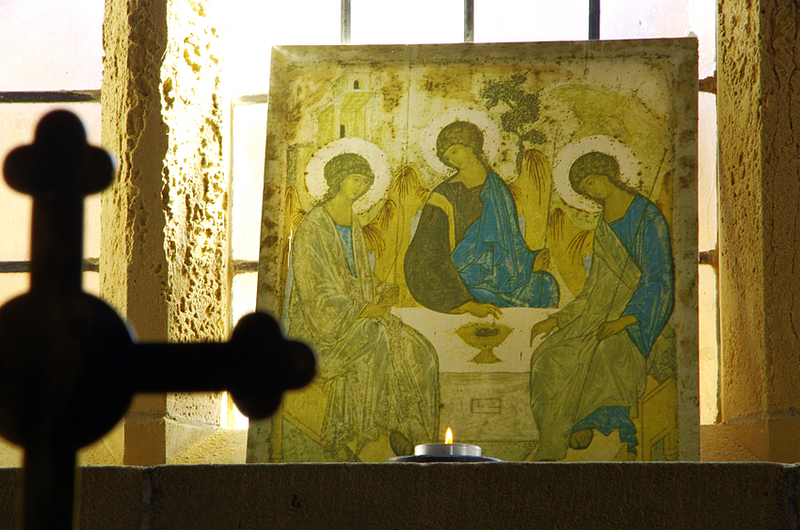 There was filled with the silence inside the church, although the strong winds blew the outside as well as the last year. Some change but others have not done; perhaps nothing has changed here for a long time. I lingered here just to feel and 'listen to' it. Back to the centre of the village at 18, I had a dinner at a restaurant in Ship Hotel, the oldest hotel in this village. Even after I finished it, the sun lingered and the sea shined beautifully. Who wanted to leave? I stepped onto the shore and wandered there. Some children chased birds. Some took walks. Some birds flew freely in the sky. It was getting dark and I returned to my B&B. There was no house nor electric light around there. After I unpacked my baggage, I turned off the lights in my room. The impressive silence and darkness filled it. A few minutes took my eyes to adjust themselves to the darkness. It was not the darkness; brilliant stars shined there through the window. Some change but others have not done especially in this small village, I said in my heart. How many times have I made a travel to Wales? How many times have I wandered on the wild nature in Wales? I have no idea but I guess I have been there more than ten times. Actually I have never been to other country including England or Ireland more than Wales. It was alwasy mcuh joy for me to chat with the locals at a pub or somewhere (and sometimes to interview them), visit some churches or villages to trace RST by his footprints (I am sure that I have followed him more than any Japanese!) 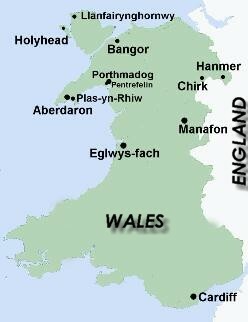 and see the historical or legendary sites in Wales. However, something on this travel was different from my former ones. I had suffered from so much stress for two years because of my very personal issues. I couldn't imagine for it to be relieved at that time. I solely sufferd, not knowing what to do. However, one of my best Welsh friends just sent me an e-mail, saying, "Come to Wales, Yoshi." I collected all of my money and flew to Wales. I arrived at Manchester airport, got a car and headed for the North Wales in early August. It was rather cold to be blown in the north wind. However, it was fine. Acctually while travelling in the wild nature and visiting some quiet villages in North Wales, I was feeling a little bit better. I stayed in Aberdaron for my friend arranged it for me. This is the place where RST wanted "to be"*. On its seashore stands St. Hywyn's church, the last church in which he served; he retired there in 1978. Right next to the church was my hotel, where RST often met someone else. I found my stress, somewhat, relieved. the quataion page is here(click to read the pdf file). these images appears courtesy of Dylans Bookstore Swansea. 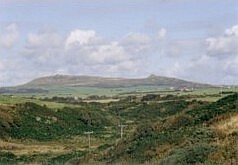 Aberdaron lies in Lleyn peninsula. In this very old village, far removed from any large centre of population, you can find Welshness in its purest forms. 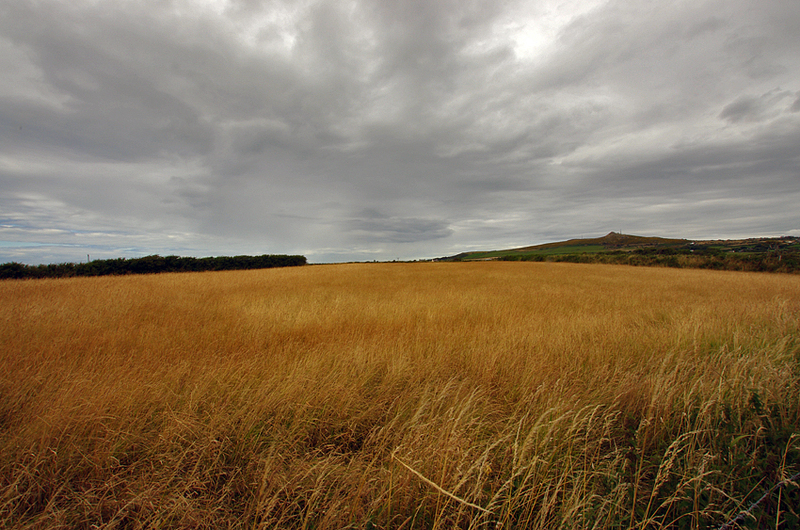 For centuries Aberdaron was also the last point on the pilgrimage way to its destination, Bardsey Island. 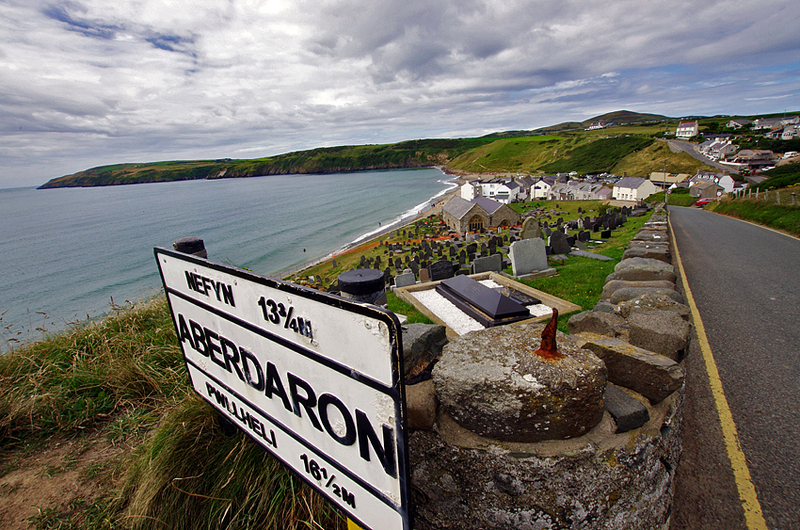 There is no train station in Aberdaron. 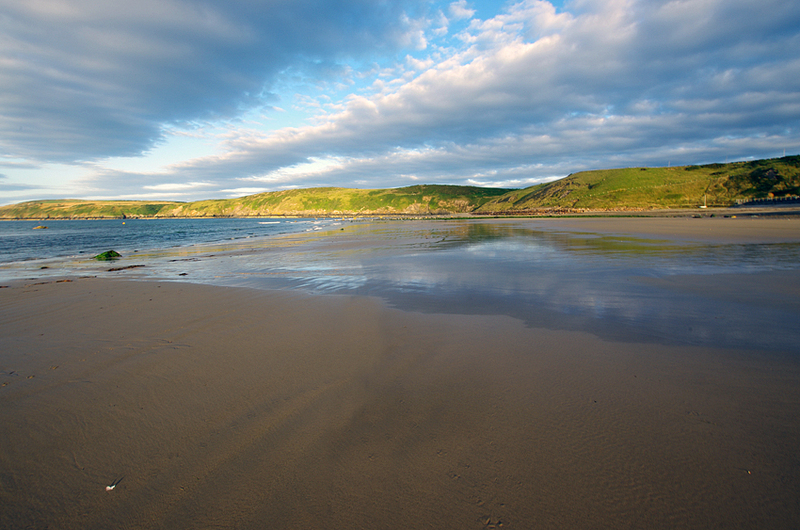 The nearest station is Pwllheli and from there you can take a bus to Aberdaron. Ask the Information centre at Pwllheli for the details. However you might need a car. The old church mentioned in the first paragraph was built in 19th century but the parishoners disliked it. 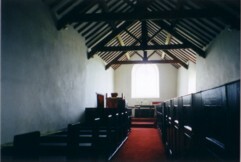 So the services got to be given at the St. Hywyn's church on the shore. 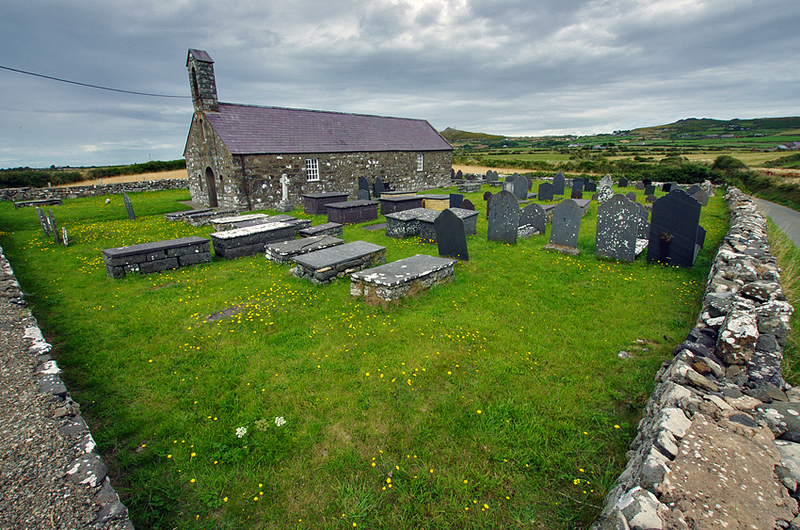 Now the old church is kept locked and only the graveyard is used. 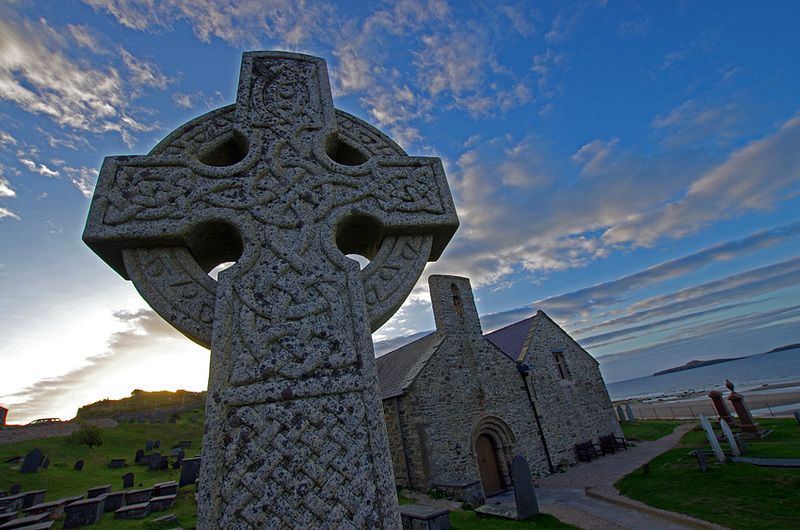 The church of St.Hywyn is located in the centre of the village and stands on the lovely bay. 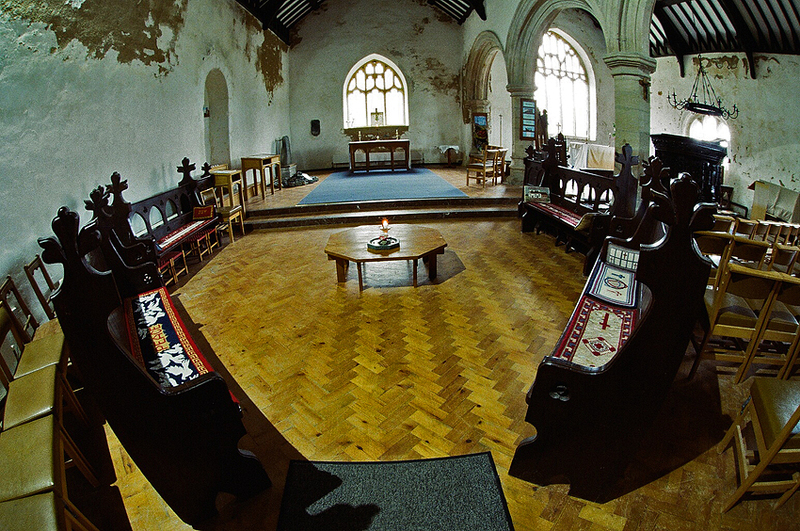 Having been fallen into a very bad condition and abandoned, however, it was rebuit and restored in the 19th century. 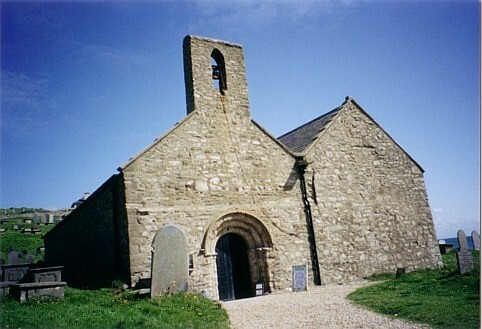 The church was founded by St. Hywyn, who accompanied a Breton saint, Cadfan, to this village in 5th century, and named after him. He was a cousin to St. Maelrhys.